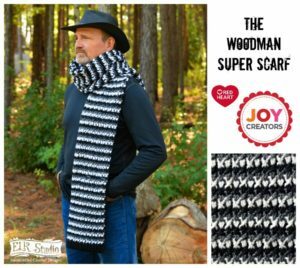 This gorgeous super scarf pattern is perfect for both men and women. The black and white seems exceedingly fitting for men, but can also work for women. Plus, for women you could choose bright and cheerful colors as well. The finished size measures 10 by 86 inches. You will need a medium weight yarn and an I crochet hook. If you enjoyed this free crochet pattern you might also enjoy more designs by ELK Studio.